Welcome to kitchen princess bamboo, Japanese everyday food. Today I’m making, Japanese Tofu salad with soy sauce dressing. 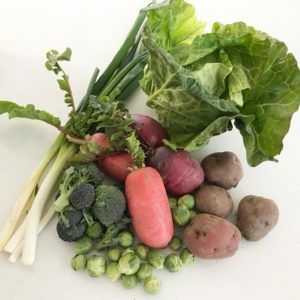 Look at those beautiful vegetables from our local farmer’s market! In Japan, we say “身土不二” which means our body can’t be apart from our soil. Eat the product where you live keeps you healthy. 1) wash your lettuce or any vegetable that you have on your hand in a salad spinner. I have frill lettuce and Mizuna green. Wash thoroughly and spin it to remove moisture. 2)Slice red daikon radish thinly by using a Japanese mandolin. Soak in water to remove pungent flavor. Do the same to a small turnip. Shave your carrot with a peeler. Put everything into a spinner. Spin to remove moisture and keep in the fridge until used. 3)Break your firm tofu into bite-size chunks. Place them onto a paper towel to remove excess moisture. By breaking the tofu, the surface becomes uneven and nicely dressed. 4) Soak dried wakame seaweed in cold water to rehydrate. It takes 10 minutes to fully rehydrated. Set aside until used. 5) Toast your sesame seed until fragrant. Toast your sesame seeds if your sesame seeds are already toasted to revive the tastes. 6) Put all the ingredients of dressing in a bottle, then shake. Add a tablespoon of ground sesame seeds and the dressing is ready. 7) Arrange your vegetables looks appealing. Place your tofu and salad chicken here and there. 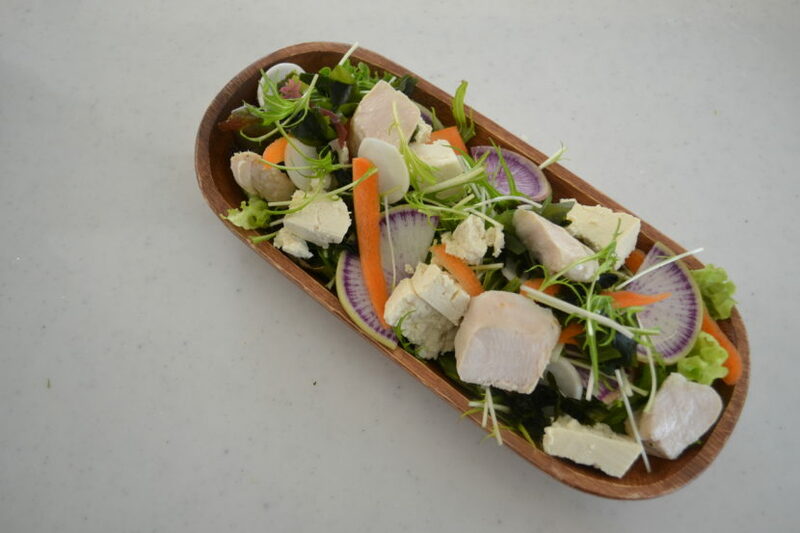 There you have your Japanese Tofu salad. In my house, I usually make a big salad like this, and the family members have as much as they want. Dress with soy sauce dressing and enjoy! We eat salad for breakfast, lunch or dinner, basically any time of the day. We typically add seaweed and tofu at the same time to our salad. This is our style, and we believe these food makes us healthy. You can find at Izakaya, the traditional Japanese restaurant. It tastes so good and makes your feel wonderful. Give it a try and let me know how you like it!